It’s like suckin’ on a juicy 7.5% ABV clementine, which 9 out of 10 craft beer aficionados agree, is more preferable to suckin’ on a chili dog outside the Tastee Freez. If you like a good India Pale Ale (IPA), and if you are a fan of citrus, then Nugget Nectar by Troegs Brewing Company is your beer of choice when late winter rolls into early spring. Yes, this is a specialty beer that Troegs trots out each February into March, giving us a citrusy prelude to a warm and fuzzy springtime bliss. And it happens to coincide with the antics of good old Phil the Groundhog. Tasked with the responsibility of prognostication, instead Phil is too drunk to face the world, and too angry to drive. He’d rather knock back a few cold ones, gnaw off the Mayor’s ear, and proceed to inform us that yes indeed he saw his shadow, condemning us all to six more weeks of winter, before heading back to his burrow for a much deserved drunken slumber. Good thing we have Nugget Nectar as a bulwark against the lingering effects of sweet Phil, keeping us safe and warm during the terminally cold grip of Old Man Winter. 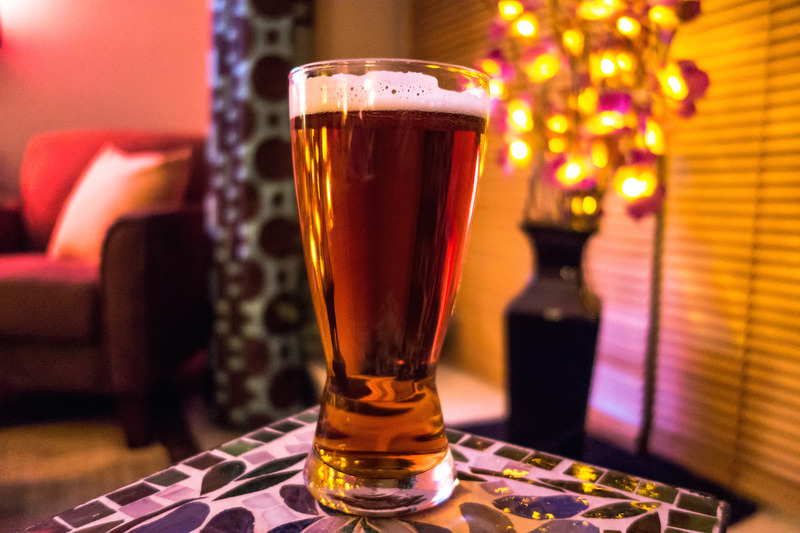 Poured into a glass, this imperial amber ale reveals a copper brown color, although when held up to a bright light it is probably best described as burnt orange, a suitable color for this mouth-watering pucker of goodness. A robust head forms, quickly dissipating to a nice lacing that hangs around until the very end. The aroma is subdued but hardly enigmatic, as it offers cues of the taste impression to follow. Carbonation is present but kept at bay, and as it hits the tongue, there is a nice blend of citrus and pine, with a satisfying and thirst quenching mellow grape fruit finish, and a nice tropical flourish for good measure. There is no doubt this is a bitter beer, but it’s a complex bitterness that doesn’t slam you over the head. In the arms race of hoppy craft beer, Nugget Nectar is not going to win any battles. Instead, it’s playing the long game, fully anticipating survival after the bloodshed and carnage has ravaged its peers. Pair it with cheese, beef, or chicken, or alternatively, just have a second (or third) Nugget Nectar.